the assortment. 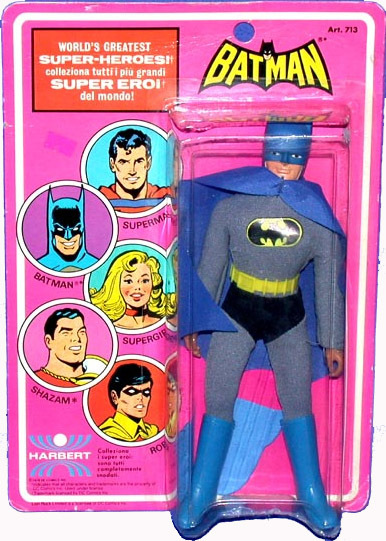 Batman also has the distinction of being one of the few figures to make it into every Mego Superhero line, no matter the format, Mego put a Batman into the mix. 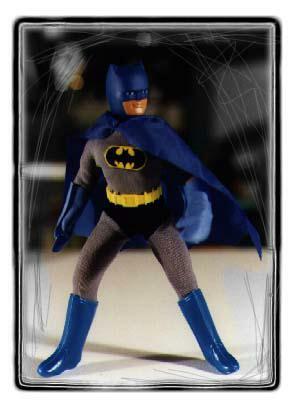 The character of Batman has always been appealing to toy manufacturers because of the many vehicles and gadgets the character uses. 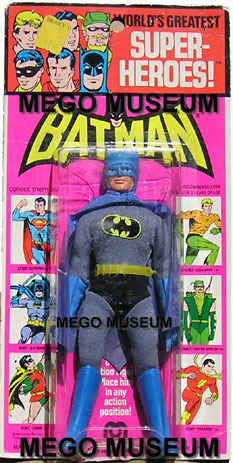 Mego was quick to exploit Batman with many Bat related playsets and vehicles. 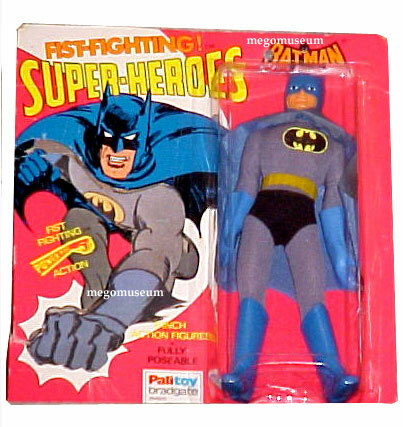 The first Batman by Mego is perhaps the quintessential Mego Action Figure. 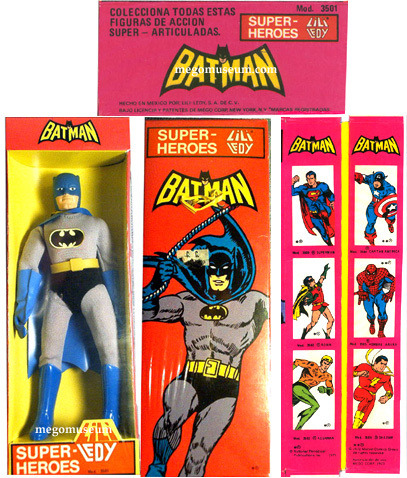 The Removable Cowl Batman came in the initial Solid Box offering, as well as early window boxes and Kresge cards. 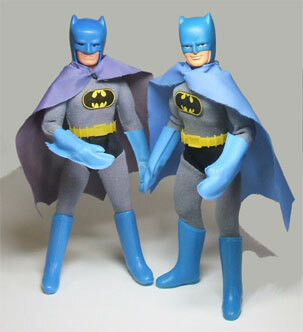 After a relatively short time (somewhere in 1974 by any guess) Mego switched to a molded head, or “Painted Cowl” Batman. The sculpt was a very light-hearted and kid-friendly approach. Note the small stubby ears on the Caped Crusader. It’s not known whether this was caused by consumer complaints (kids would lose the cowl in a heartbeat) or a cost- cutting, production-simplifying decision. 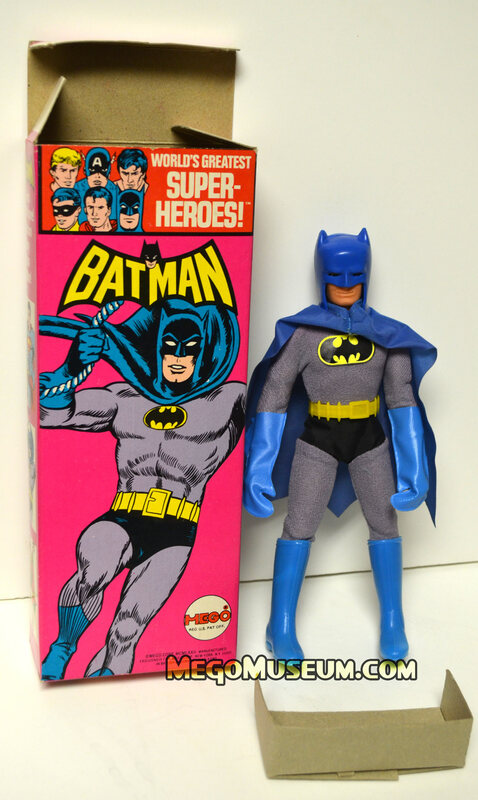 The first Batman (Removable cowl) were sold in solid boxes for a short period of time in 1973. 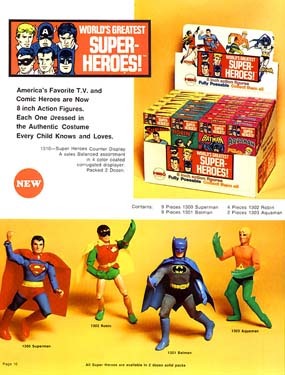 While the graphic is the same on the back of all Mego Batman boxes, this is in fact a solid box from the very first wave of Heroes. 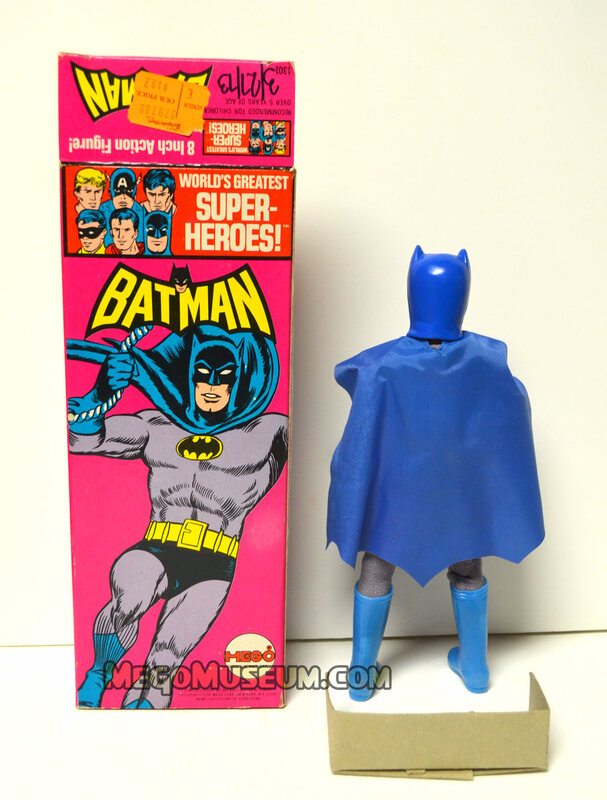 The solid Batman box is one of the hardest to find items of all, because it was in circulation for a very short period of time. Retailer’s complained that kids ripped the solid boxes open to see the doll, so window boxes and bubble cards were quickly introduced. This immaculate example has the very rare cardboard inset. This example was purchased at Bargain Town for $1.97 on March 27th 1973. 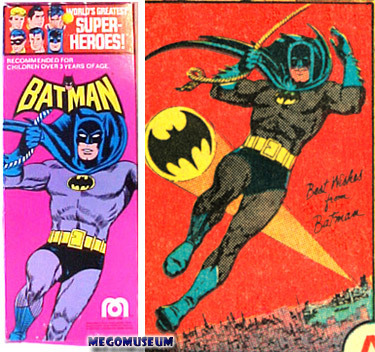 As illustrated in the Mego Museum Library’s Comic Origins of Mego Art the Mego Batman box art was a Mego trace-job of a now-classic Batman Carmine Infantino image that was sold on posters advertised in comic books. 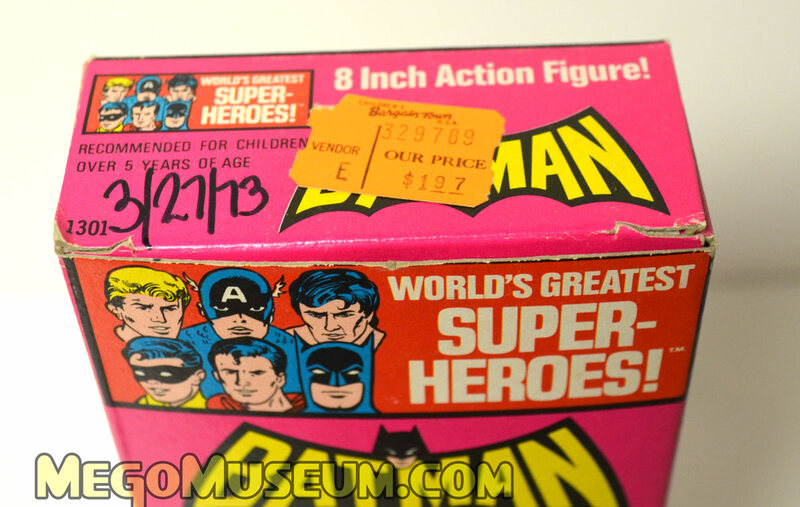 Early 4 panel Batman box showing Cap and Spidey on it. Removable Cowl Batman came in this box. This is the last version Batman box, bearing a 5-digit code, circa 1976. 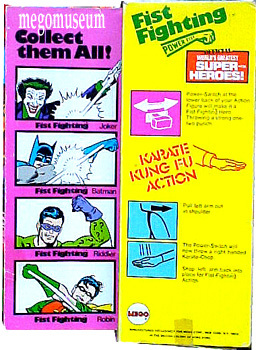 Above is the Mego Fist Fighting Batman in box. See the FF Gallery for more info. 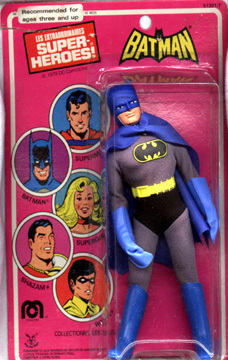 Above, a First Issue Mego Kresge RC Batman (1st issue by the four heroes on the header). 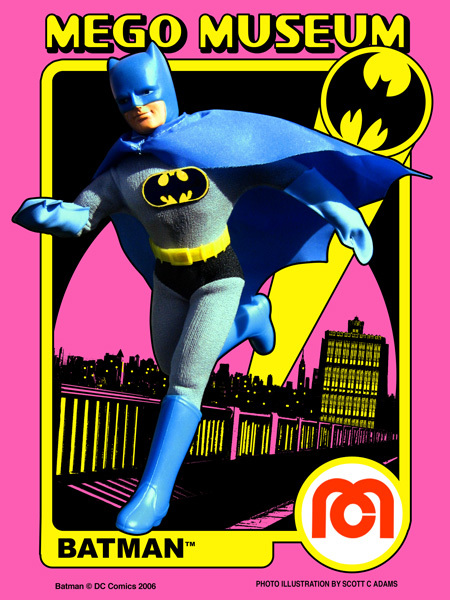 Note that the Mego logo doesn’t appear on this card. Courtesy of Tom. Left is a later Batman on the Kresge card, note the Green Arrow replacing Tarzan in the header. This is the last Kresge card variant in the series. Tom provides the Museum with a look at all of the US cards. Note the ever changing style guide artwork. 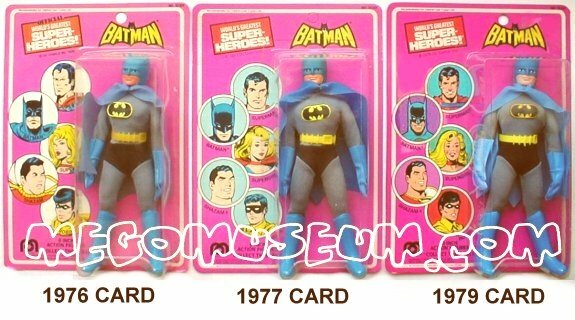 On the Left is Batman on his 1979 Pin Pin Toys Card (France) Courtesy of Troy. Left is a 79 Harbert Italy card (From Scott Arendsen) Many foreign companies simply chose to put their logo over stock Mego products. 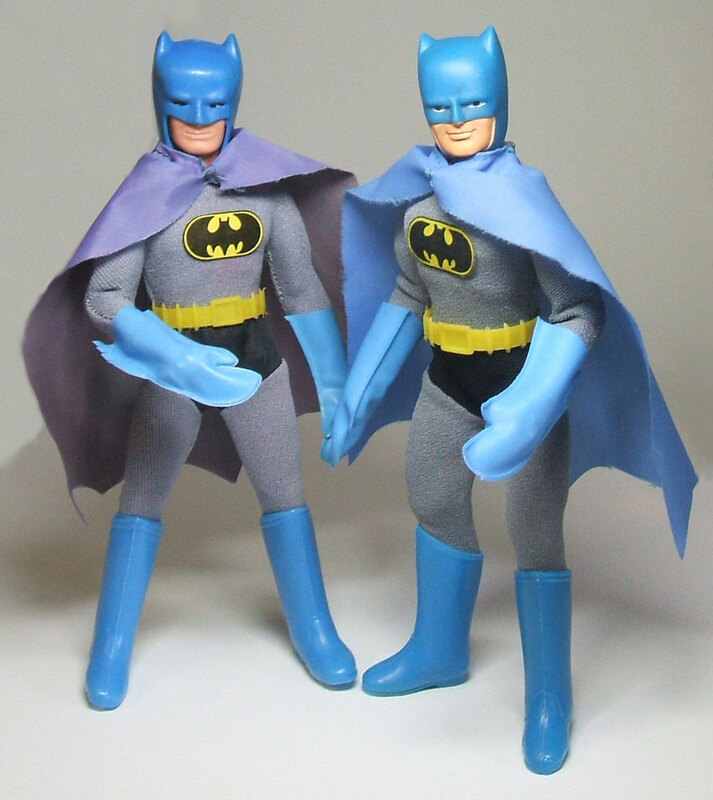 Palitoy (UK) Mego Carded Batman courtesy of Bill Frost. 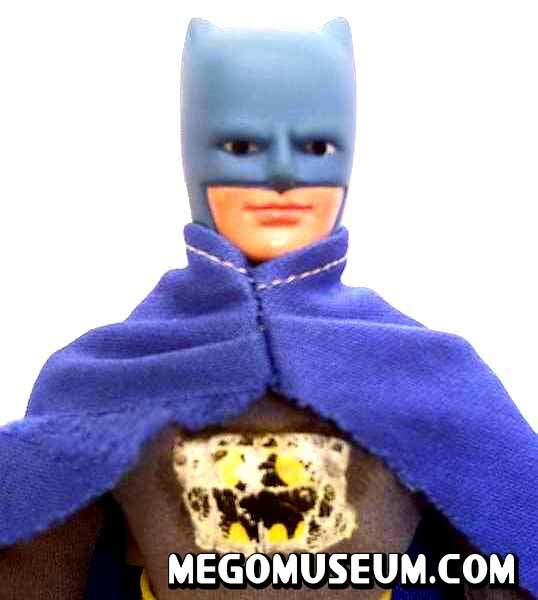 New to the Museum is the Mexican Batman produced by Lili Ledy under License by Mego. 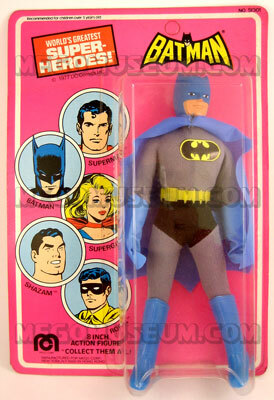 It seems Mexican toys had to be produced locally so Mexican Mego figures have a different, albeit charming look. This UBER rare boxed figure comes courtesy of Luis, a friend to the Museum. 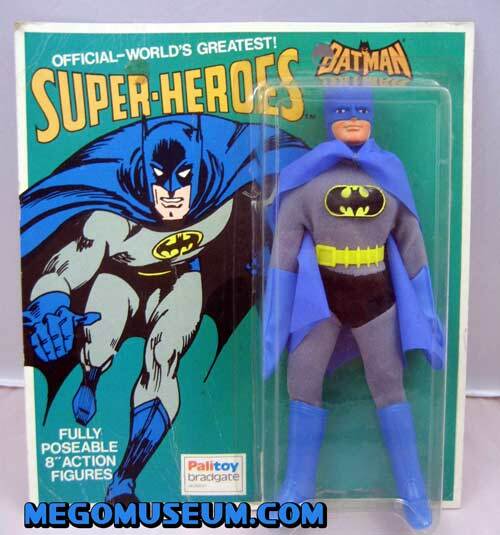 Very Rare Peruvian version of Batman (made under license by toy manufacturer BASA) was provided by Megomuseum member Rudy (with some assistance from Stefano). 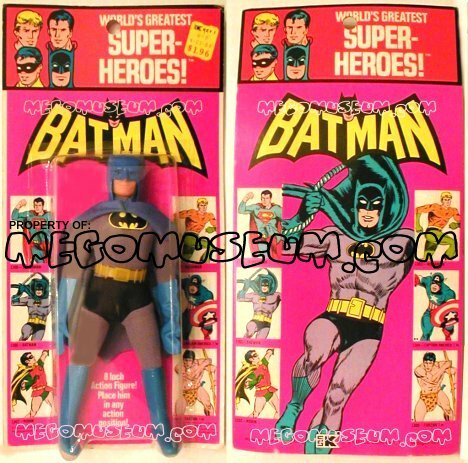 Mego Batman had two playsets and five vehicles produced in his name, not to mention role play items. Visit the Playsets department in the left menu bar. 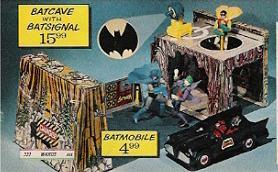 A number of Batman playsets and vehicles were produced in other formats by Mego. 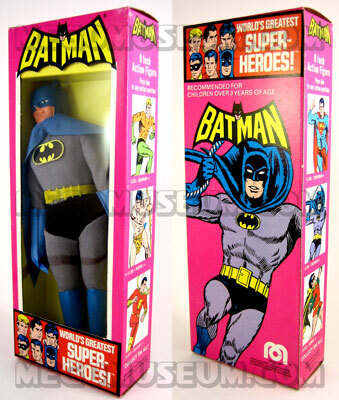 Of particular note would be the Super Softies , Bend N Flex and Comic Action Heroes but if it was a Superhero item made by Mego, Batman was there. All original Batman suits (whether nylon, canvas or cloth shorts verions) have shorts sewn into the jumper. Doc’s factory made version is two pieces, a grey jumper, and a black pair of Robin style shorts over top. The jumper is marked DM on the inside, the shorts are unmarked. There are a lot of high quality home make paper and cloth emblems out there, but Doc’s in the only factory made version. It’s a paper die cut and actually looks much cleaner than the original paper version, which tends to look like a bad print job. 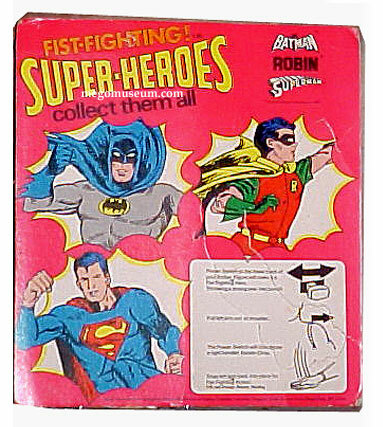 Both Doc Mego and Classic TV Toys make gloves. DM gloves are textured similar to originals and marked DM on the inside cuff. CTVT’s are very slick and shiny compared to the originals and are unmarked. 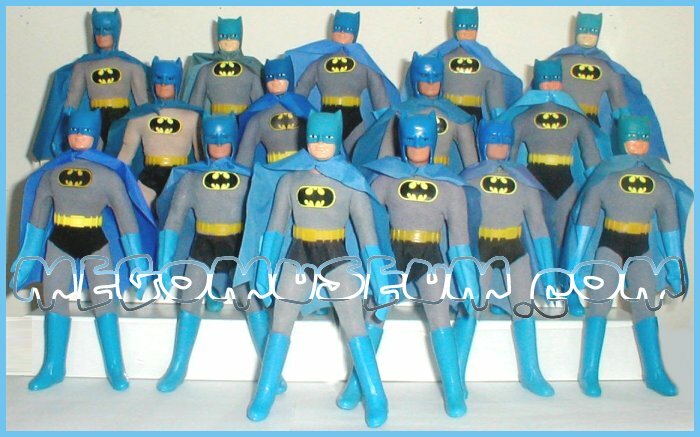 Standard Batman capes come in a variety of shades of blue. 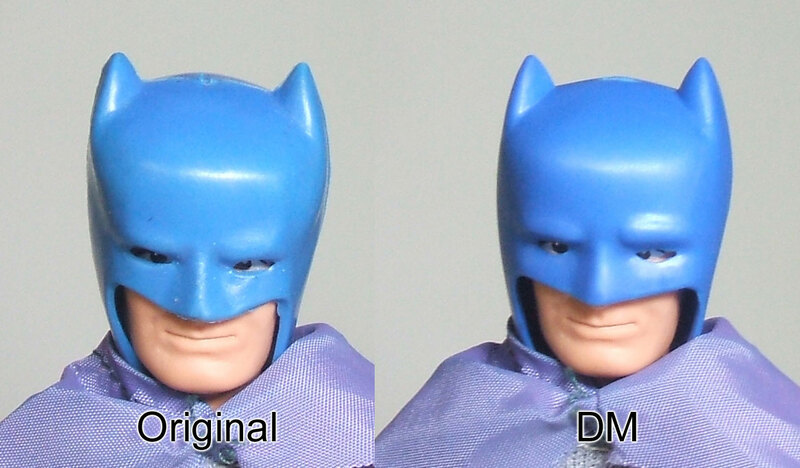 Doc’s is the only factory made cape in town and is very accurate in design, although the color is a deeper than the average loose Batman cape. DM is printed on the inside back. 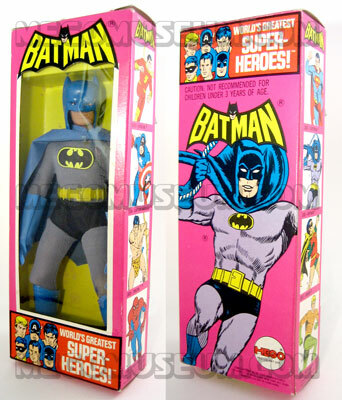 Also an orignal Mego make for Batman is the vinyl variation. It’s fairly uncommon and hasn’t been factory reproduced. 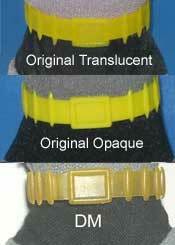 Batman has two belt variations, translucent and opaque. Doc Mego produced the only known factory made BatBelt and it is VERY close to the original translucent version, although the tips of the “points” are a little more rounded. It is stamped DM on the back of the buckle. There are two types of Batman boots. The early versions came with what is called the “skinny” boot which is more narrow than the later standard hero boot. Both DM and CTVT have made boots. DM’s are more color accurate with thicker plastic, more round around the edges and stamped DM on the bottom. CTVT’s are closer in thickness and shape, but more transparent which makes them look almost teal in color. They are unmarked. 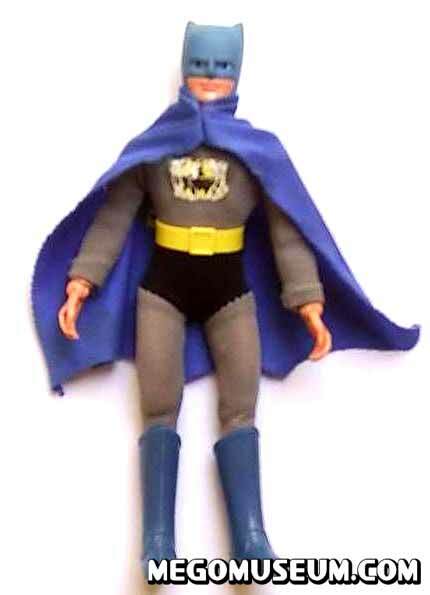 Doc Mego’s cowl is very similar to the original in color. The biggest difference is it’s material. It is a little thinner, so doesn’t fit as tight to the face. It is also more flexible and has a more of a matte finish. It is stamped DM on the inside top of the cowl. 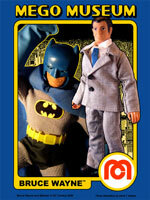 There are several versions of the Bruce Wayne head out there on different figures, all original Mego. The Batman head has black eyes with white spots andy copyright information on the back of the neck. The Bruce Wayne version is the same with no copyright info. The head was also used for Tex Willer. He has black eyes with no white spots and no copyright information. Again, the head was used on the Mystery Man. This time with blue eyes and no copyright info on the neck. Finally the head sculpt was used on Jet Jungle (not pictured here)and had white hair. Both DM and CTVT made reproduction heads. Each factory made repro head is a touch different. The biggest difference is the overall shape of the head. DM’s is a little wider at the top of the head than an original and made of a firmer material and is marked DM on the back of the neck. CTVT’s is a little more squat, not as long as the original, and made of a softer, more squishy material. It is unmarked.